PAHOA, Hawaii—A river of lava spewing from the foot of Hawaii’s Kilauea Volcano swallowed about three dozen more homes on the Big Island during a weekend of destruction that brought to nearly 120 the number of dwellings devoured since last month, officials said on Monday. The latest damage came from a large lava flow that crept several miles before severing a key highway junction at Kapoho on Saturday and then obliterating about a half-dozen blocks of the subdivision over the weekend, the spokesman said. On Monday, civil defense reported a total of 117 homes and other structures destroyed across the island’s larger lava-stricken region, as the eruption from Kilauea, one of the world’s most active volcanoes, continued through its 33rd day. About three dozen of those structures, mostly private homes and vacation rentals, were lost during the weekend in Kapoho. The rest were consumed weeks earlier in the larger Leilani Estates subdivision several miles to the west, where lava-spouting fissures in the ground first opened on May 3. Plumes of volcanic ash belched into the air by periodic daily explosions from the crater at Kilauea’s summit have posed an additional nuisance and a health concern to nearby communities. 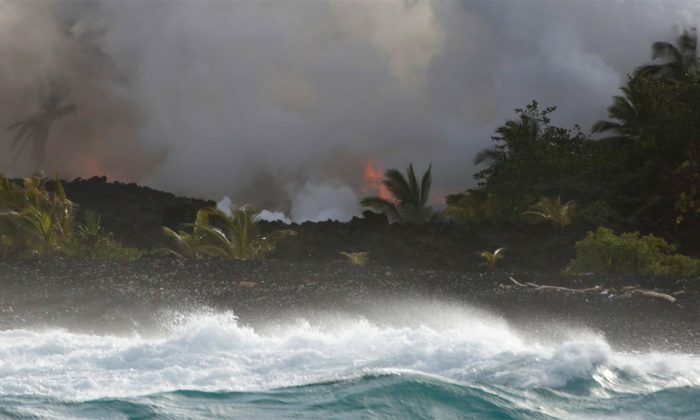 So too have airborne volcanic glass fibers, called “Pele’s hair,” wispy strands carried aloft by the wind from lava fountains and named for the volcano goddess of Hawaiian myth. 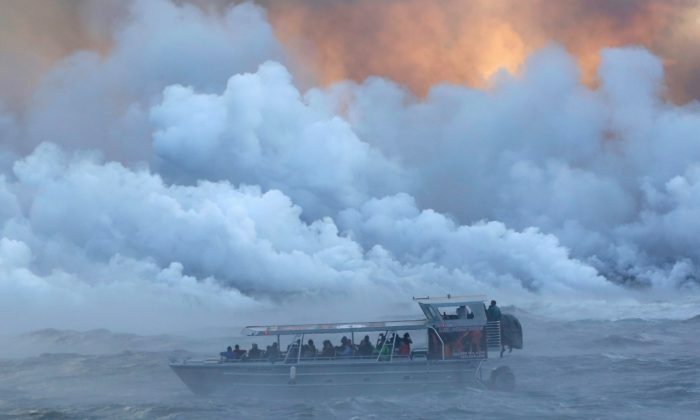 Seaside residents and boaters also have been warned to avoid noxious clouds of laze — a term combining the words “lava” and “haze”—formed when lava reacts with seawater to form a mix of acid fumes, steam and glass-like specks. Lava flows have knocked out telephone and power lines, causing widespread communication outages, and forced the shutdown of a geothermal energy plant that normally provides about a quarter of the island’s electricity. At the same time, most of the Hawaii Volcanoes National Park, one of the island’s biggest tourist attractions, remains closed indefinitely due to hazards from ash and volcanic rock ejected from the summit crater, and accompanying earthquakes that have damaged park facilities. Kilauea’s current upheaval comes on the heels of an eruption cycle that began in 1983 and had continued nearly nonstop for 35 years, destroying more than 200 homes. Scientists say they are unsure whether the latest activity is part of the same eruption phase or a new one, and how long it may last.